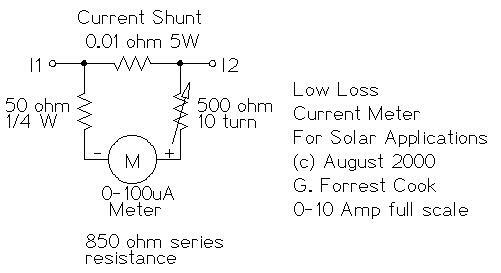 This circuit is used to measure the current from a solar panel. It has very low power loss for currents in the 0-10A range. It also works as a general purpose DC current meter. The circuit can be used on either the positive or negative side of a DC circuit. Circuit Voltage: Will work with DC circuits at any practical voltage. Accuracy: approximately 2%, depending on the meter movement. The current to be measured flows through the 0.01 ohm resistor which causes a small voltage drop across the resistor. The 100 microamp meter is set up with the series 50 ohm and 500 ohm variable resistor in a voltage measurement configuration to measure this voltage drop. The 500 ohm variable resistor is used to adjust the meter's full scale reading. The 50 ohm resistor limits the maximum current to the meter no matter what setting is on the 500 ohm resistor, this protects the meter from passing too much current and burning up. The series resistance of the meter, 500 ohm (or less) variable resistor and 50 ohm resistor should total 1000 ohms. Different meters may require a different variable resistor to achieve the 1000 ohm value. Build the meter into a metal box with the meter and two connectors mounted on the outside of the box. Put the meter circuit in series with a known current meter such as a digital VOM meter set to measure current. Run a known current through both meters. Adjust the 500 ohm resistor until both meters read the same current. A good way to get a known current is to put a 12V lead acid battery in series with a 2 ohm 100 watt current limiting resistor. This will produce approximately 6 Amps of current. Put the two meters in series with this loop and adjust for the same reading. Beware, the resistor will get fairly hot in a short time. Connect this circuit in series with a nominal 12V or 24V solar panel array. The meter can go in either the positive or negative side of the solar panel circuit. The current flowing through the solar panel to the load will be shown on the meter. 2x banana plugs or a 2 pin screw type terminal block.